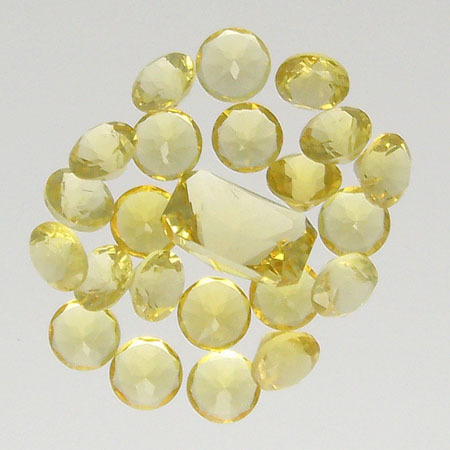 Heliodor, also referred to as Golden or Yellow Beryl, is a soft clear yellow. Other members of the beryl gemstone family include Aquamarine, Emerald and Morganite. The mining company that discovered it in 1913 named it Heliodor after the Greek words for sun “helios” and gift “doron.” In 1914, that company commissioned a leading jewelry designer of the time to create a fabulous jewelry ensemble for Kaiser Wilhelm II of Germany and his wife. These marketing efforts made golden beryl a sensation worldwide. However, World War I took the focus away from this beautiful gem and it was largely forgotten. While Heliodor’s durability and summery color make it excellent for jewelry, its rarity keeps it from being used in manufactured jewelry. 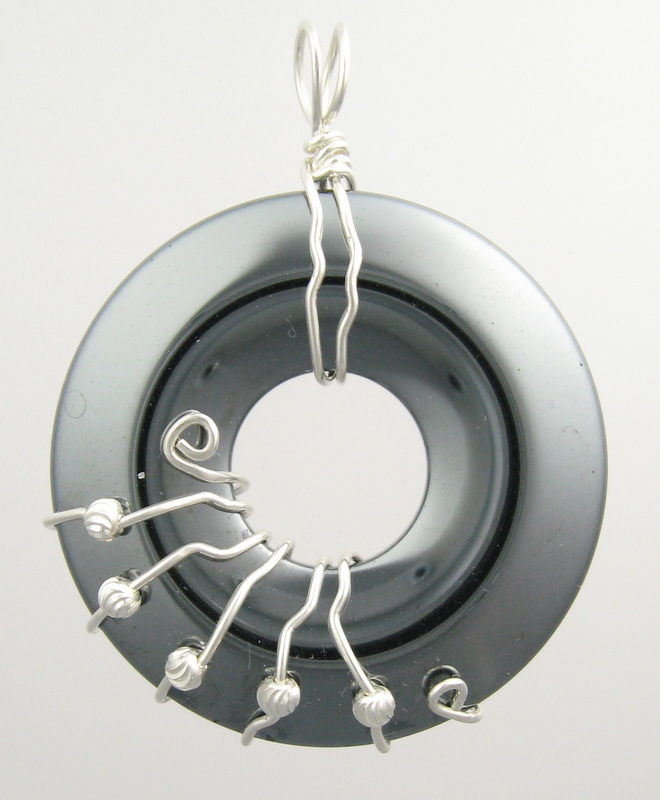 When made into custom jewelry, it is excellent for daily wear. Heliodor is said to promote purity of being, stimulate the will to succeed and the ability to turn potential into reality. It is also believed to enhance one’s intuition and to improve one’s communicative abilities. ​Hematite is a steely gray-black gemstone that almost looks like metal. Chemically, it is iron oxide. Nearly all hematite on the market is actually man-made with all the same chemical properties of natural hematite. This simulated material is easier to form into various shapes; yet it still has the look and feel of natural hematite. Hematine, hemalike and hemalyke are some of the names by which simulated hematite is marketed. Hematite gets its name from the Greek word for blood “haimo” because red is the color of powdered hematite. It has been used in seals since 2500 B.C. and was used as an inscription stone for passages from the Book of the Dead. Roman warriors used hematite as protection during battle. And Native Americans used it to make red face paint. Until recently, cosmetic blushers often contained ground hematite. Hematite is called the “stone of mental mastery” and many believe it aids clarity, balance, calm and reason. It is also said to transform negativity into love. 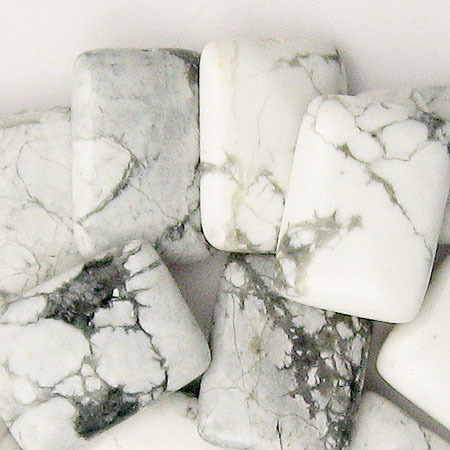 ​Howlite is a white stone with gray or black veins in an erratic often web-like pattern. It was discovered by Henry How in 1868 in Nova Scotia. Howlite is a relatively soft stone and readily accepts dyes. It is often dyed to simulate stones such as turquoise and lapis. In its natural form, howlite is sometimes marketed as white turquoise. Howlite is known as the tranquility stone or calming stone. It is believed to reduce stress and ease an overactive mind so you can sleep easily and restfully. Care: Use warm, soapy water to clean howlite. Never use steamers or ultra-sonic cleaners. Keep away from harsh cleaners, acids and strong sunlight. ​Hyacinth is the old term for yellow, yellow-red to red-brown zircon. This name goes back to biblical times. And before there were mineralogical classifications for gemstones, Hyacinth may also have referred to an orange or brownish topaz.